Chosen for the 2011 ASLI Choice - Honorable Mention (History Category) for a compendium of the key scientific papers that undergird the global warming forecast. Global warming is arguably the defining scientific issue of modern times, but it is not widely appreciated that the foundations of our understanding were laid almost two centuries ago with the postulation of a greenhouse effect by Fourier in 1827. The sensitivity of climate to changes in atmospheric CO2 was first estimated about one century ago, and the rise in atmospheric CO2 concentration was discovered half a century ago. The fundamentals of the science underlying the forecast for human-induced climate change were being published and debated long before the issue rose to public prominence in the last few decades. 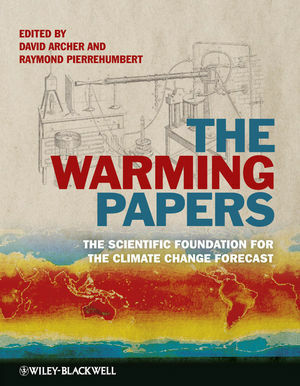 The Warming Papers is a compendium of the classic scientific papers that constitute the foundation of the global warming forecast. The paper trail ranges from Fourier and Arrhenius in the 19th Century to Manabe and Hansen in modern times. Archer and Pierrehumbert provide introductions and commentary which places the papers in their context and provide students with tools to develop and extend their understanding of the subject. The book captures the excitement and the uncertainty that always exist at the cutting edge of research, and is invaluable reading for students of climate science, scientists, historians of science, and others interested in climate change. David Archer is a Professor in Geophysical Sciences, and a fellow of the American Geophysical Union. His research pertains to the global carbon cycle and its relation to Earth's climate in the past and the future. Archer is the author of The Long Thaw: How humans are changing the next 100,000 years of Earth's climate (Princeton University Press, 2008), an undergraduate text book called Global Warming: Understanding the Forecast (Blackwell, 2006), and a summary guide to the IPCC Fourth Scientific Assessment Report called The Climate Crisis (Cambridge University Press, 2009). Ray Pierrehumbert is the Louis Block Professor in Geophysical Sciences, a Fellow of the American Geophysical Union, and was named Chevalier de l'Ordre des Palmes Academiques by the Republic of France. Pierrehumbert studies the physics of climate, especially regarding the long-term evolution of the climates of Earth, Mars.Venus, Titan and extrasolar planets. Pierrehumbert was an author of the Intergovernmental Panel on Climate Change's Third Assessment Report (1997-2001), and a member of the National Research Council's Panel on Abrupt Climate Change and its Societal Impacts (2000-2001), and is currently serving on the National Research Council Board on Atmospheric Science and Climate, and the National Research Council Panel on CO2 Stabilization Targets. On the Temperatures of the Terrestrial Sphere and Interplanetary Space (Jean-Baptiste Joseph Fourier (1824)). On the Absorption and Radiation of Heat by Gases and Vapours, and on the Physical Connexion of Radiation, Absorption, and Conduction (John Tyndall (1861)). 3 By the Light of the Silvery Moon. On the Influence of Carbonic Acid in the Air upon the Temperature of the Ground (Svante Arrhenius (1896)). The Influence of the 15 m Carbon-dioxide Band on the Atmospheric Infra-red Cooling Rate (G. N. Plass (1956)). 5 The Balance of Energy. Thermal Equilibrium of the Atmosphere with a Given Distribution of Relative Humidity (Syukuro Manabe and Richard T. Wetherald (1967)). The Effect of Solar Radiation Variations on the Climate of the Earth (M. I. Budyko (1968)). A Global Climatic Model Based on the Energy Balance of the Earth–Atmosphere System (William D. Sellers (1968)). 6 The Birth of the General Circulation Climate Model. The Effects of Doubling the CO2Concentration on the Climate of a General Circulation Model (Syukuro Manabe and Richard T. Wetherald (1975)). Climate Sensitivity: Analysis of Feedback Mechanisms (J. Hansen, A. Lacis, D. Rind, G. Russell, P. Stone, I. Fung, R. Ruedy, and J. Lerner (1984)). Climate Response to Increasing Levels of Greenhouse Gases and Sulphate Aerosols (J. F. B. Mitchell, T. C. Johns, J. M. Gregory and S. F. B. Tett (1995)). 8 Ocean Heat Uptake and Committed Warming. Earth's Energy Imbalance: Confirmation and Implications (James Hansen, Larissa Nazarenko, Reto Ruedy, Makiko Sato, Josh Willis, Anthony Del Genio, Dorothy Koch, Andrew Lacis, Ken Lo, Surabi Menon, Tica Novakov, Judith Perlwitz, Gary Russell, Gavin A. Schmidt and Nicholas Tausnev (2005)). Global Temperature Variations Between 1861 and 1984 (P. D. Jones, T. M. L. Wigley and P. B. Wright (1986)). Contribution of Stratospheric Cooling to Satellite-Inferred Troposphoric Temperature Trends (Qiang Fu, Celeste M. Johanson, Stephen G. Warren and Dian J. Seidel (2004)). Northern Hemisphere Temperatures During the Past Millennium: Inferences, Uncertainties, and Limitations (Michael E. Mann, Raymond S. Bradley and Malcolm K. Hughes (1999)). 10 Ice Sheets and Sea Level. Surface Melt–Induced Acceleration of Greenland Ice-Sheet Flow (H. Jay Zwally, Waleed Abdalati, Tom Herring, Kristine Larson, Jack Saba and Konrad Steffen (2002)). Man-Made Carbon Dioxide and the "Greenhouse" Effect (J. S. Sawyer (1972)). Carbon Dioxide and Climate: A Scientific Assessment (Jule G. Charney, Akio Arakawa, D. James Baker, Bert Bolin, Robert E. Dickinson, Richard M. Goody, Cecil E. Leith, Henry M. Stommel and Carl I. Wunsch (1979)). Part II The Carbon Cycle. 12 The Sky is Rising! The Artificial Production of Carbon Dioxide and its Influence on Temperature (G. S. Callendar (1938)). Carbon Dioxide Exchange Between Atmosphere and Ocean and the Question of an Increase of Atmospheric CO2during the Past Decades (Roger Revelle and Hans E. Suess (1957)). Distribution of Matter in the Sea and Atmosphere: Changes in the Carbon Dioxide Content of the Atmosphere and Sea due to Fossil Fuel Combustion (Bert Bolin and Erik Eriksson (1958)). The Concentration and Isotopic Abundances of Carbon Dioxide in the Atmosphere (Charles D. Keeling (1960)). Is Carbon Dioxide from Fossil Fuel Changing Man’s Environment? (Charles D. Keeling (1970)). 15 One If by Land. Changes of Land Biota and Their Importance for the Carbon Cycle (Bert Bolin (1977)). Observational Constraints on the Global Atmospheric CO2 Budget (Pieter P. Tans, Inez Y. Fung and Taro Takahashi (1990)). Acceleration of Global Warming Due to Carbon-Cycle Feedbacks in a Coupled Climate Model (Peter M. Cox, Richard A. Betts, Chris D. Jones, Steven A. Spall and Ian J. Totterdell (2000)). 16 Two If by Sea. Neutralization of Fossil Fuel CO2 by Marine Calcium Carbonate (W. S. Broecker and T. Takahashi (1977)). Effects of Fuel and Forest Conservation on Future Levels of Atmospheric Carbon Dioxide (James C. G. Walker and James F. Kasting (1992)). Abrupt Deep-Sea Warming, Palaeoceanographic Changes and Benthic Extinctions at the End of the Palaeocene (J. P. Kennett and L. D. Stott (1991)). Anthropogenic Carbon and Ocean pH (Ken Caldeira and Michael E. Wickett (2003)). Reduced Calcification of Marine Plankton in Response to Increased Atmospheric CO2 (Ulf Riebesell, Ingrid Zondervan, Björn Rost, Philippe D. Tortell, Richard E. Zeebe and François M. M. Morel (2000)). Evidence From Polar Ice Cores for the Increase in Atmospheric CO2 in the Past Two Centuries (A. Neftel, E. Moor, H. Oeschger and B. Stauffer (1985)). Vostok Ice Core Provides 160,000-Year Record of Atmospheric CO2(J. M. Barnola, D. Raynaud, Y. S. Korotkevich and C. Lorius (1987)).